In Saint’s Testimony, Frank O’ Connor’s short story taking place within the Halo universe, the AI Iona stands before a court to argue why she should not be deactivated. The lore of Halo is so monstrous and so in depth that it might look like climbing Mount Everest to Newcomers but what you need to know with the role of AI’s in the fiction, is that after seven or eight years, they experience something their creators call ‘rampancy’. Madness, if you will. In Saint’s Testimony, the AI known as Iona is beginning to show signs of rampancy but when we meet her, she is sitting in a court-awaiting trail to determine whether or not she will be deactivated and made useless. Like great science fiction before it, Saint’s Testimony touches on the idea of what it means to be real and whether Artificial Intelligence can be determined to be as real as humanity. It’s an intriguing idea but sitting at 47 pages, there’s not a lot of time to develop this theme beyond the initial idea of an AI feeling real. If this were this a novel, this could’ve been expanded into a journey about this consciousness’s fight for her own survival. 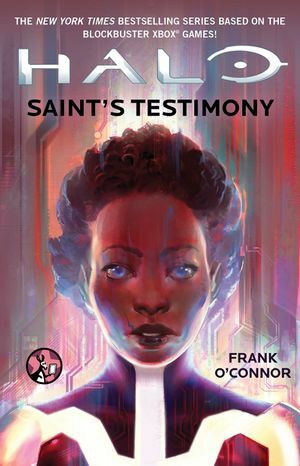 In any case, Saint’s Testimony is a short story that touches on a few juicy plot points, such as the AI’s ability to feel and to dream, and for a science fiction fan, this was an interesting read. I guess then that the story was successful. It made me want more. Seeing as though this is part of the Halo lore, there’s always a possibility that it’ll resurface somewhere somehow. After all, the themes of this tale tie into Halo 4. But should it be left alone, in the short pages, Iona was a compelling character. Tragic, compelling and interesting to learn about. How it will impact the Halo universe remains to be seen.